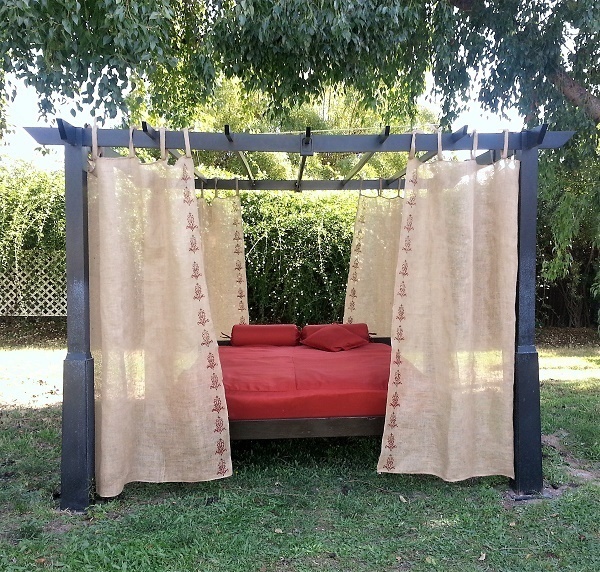 Have you thought about converting your old mattress into an outdoor daybed? You just bought a new mattress and now you have to discard the old one. Of course, as you probably know discarding mattresses are a nightmare. They are clunky and most people just throw them in a dumpster (when they can find one), or on the sidewalk on “bulk trash” day, or they have to drive to the nearest “dump”. Which is also a nightmare with all the rules about when and if they will accept your mattress. Donation places won’t take them as easily (maybe because of fear of bedbugs), so a lot of times mattresses just sit there by the side of the house or in the garage taking all that space. When I bought my new memory foam mattress I was in heaven. It was nice and firm, and it was great to wake up refreshed. If you order them online through the above links you can also apply for Amazon Prime and get free delivery, which is better than most mattress stores that charge a lot for delivery. You can click below to apply for a Free 30-Day Trial of Amazon Prime. Anyway, my old mattress was very high quality, it was still in good shape and it still had some life in it. I didn’t want to throw it away but I knew no one would take it other than bulk trash. I felt bad about sending something perfectly good to the landfill. Plus, you all know I try to save the earth as much as I can. 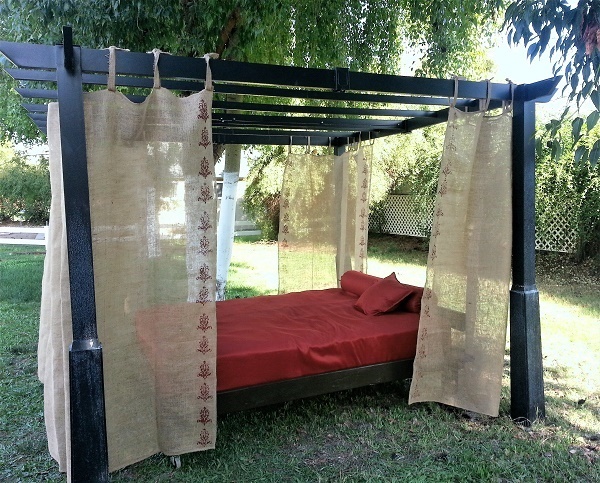 My solution: Why not reuse that mattress and make an outdoor daybed? 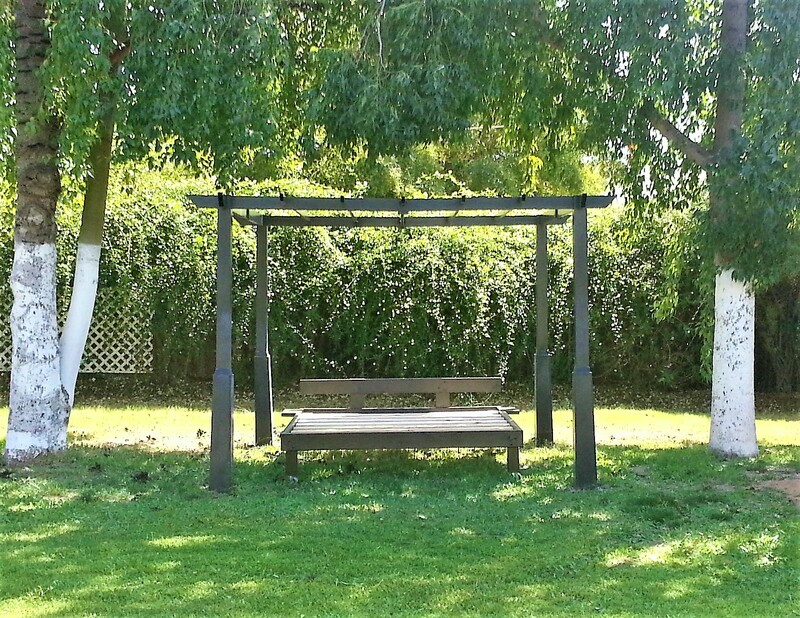 I have this area in my backyard that has a lot of trees and even in the hot Arizona Summer, it’s a cool spot to hang out. 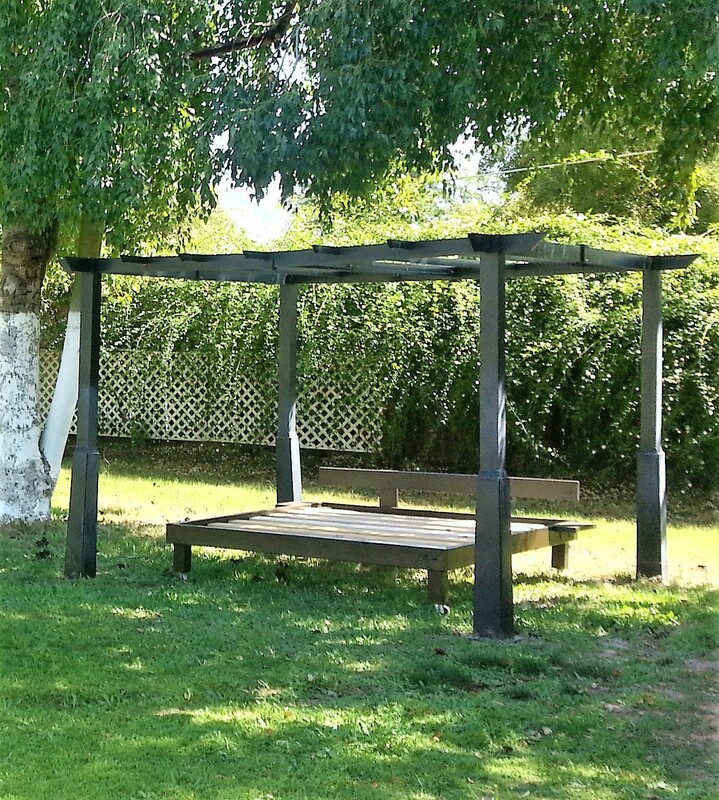 I thought, wouldn’t it be nice to have a daybed under those trees? It would be the perfect place to read a book and drink some iced tea in the afternoon and “chillax“!. Of course, I wanted to save money so I decided to build it. The project was very simple and the secret is in the bolts holding the whole thing together. 2 boards for the header and 2 for the sides. 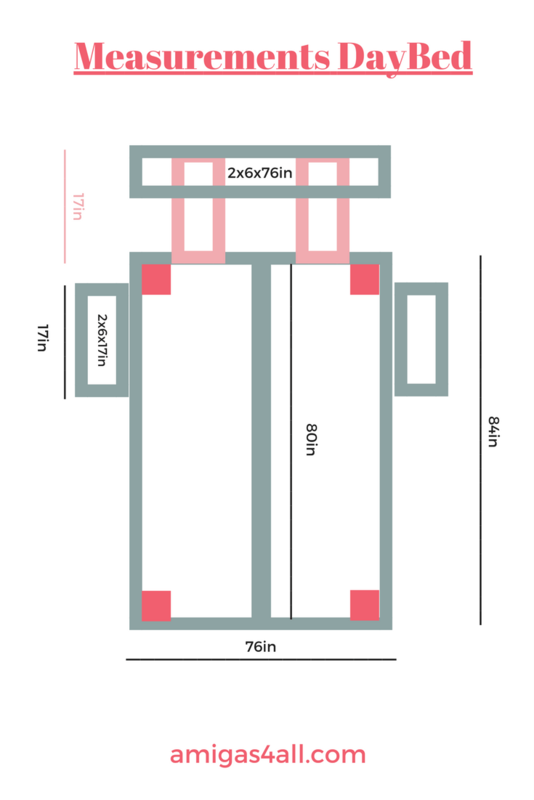 1 2x4x80in board: for the center of the bed frame. 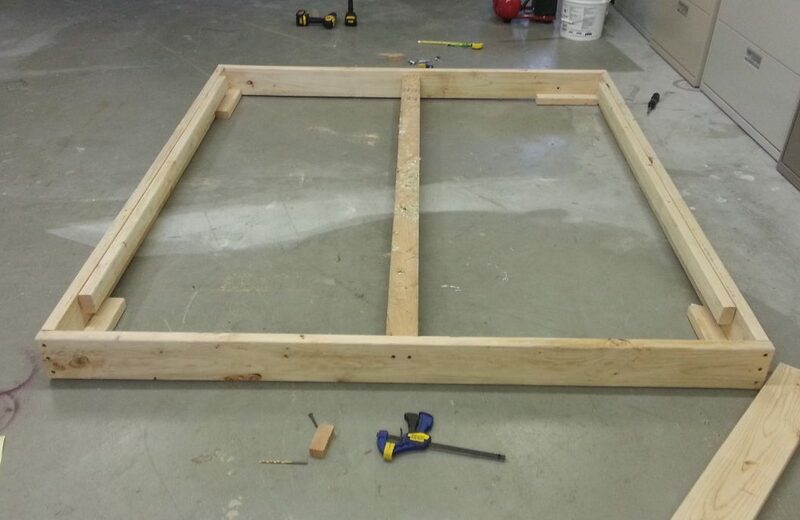 2 1x2x75in boards: for the inside frame to support the slats. Pieces to support the middle board. Start by cutting the boards to size using my schematic above. Consider the size of your mattress and give at least 1 inch more to give room for any bed covers to fit in. I started with the frame first. Glue each corner with liquid nails or wood glue and use wood screws to join them together. It will make things easier when you are trying to add the bolts into the frame. Glue and attach the inside boards (1x2s) to the side of the bed frame (level with the floor). This is where the slats will rest on. 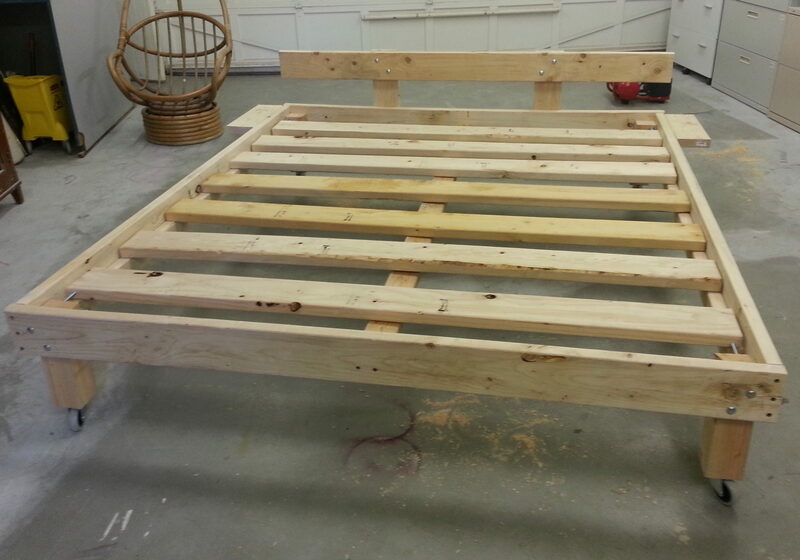 After attaching the side boards, flip the frame over (this will be how the frame will remain when the daybed is done). Measure the distance from the top of the side board (inside the frame) to the top of the frame (this will tell you the distance you have to level the middle frame). Mark the measurement on each end at the center of the head and foot of the frame. You want to make sure that the center frame is at the same level of the boards inside the frame. See image below (this is “under” the bed). 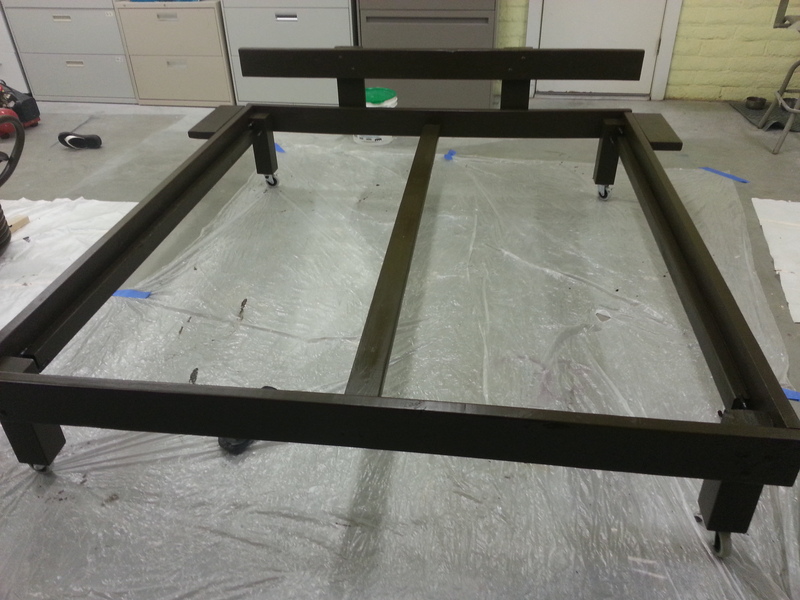 Once the frame is ready and stabilized with wood screws and glue, it’s time to attach the legs to each corner of the frame. (Note: the boards you see on each corner in the image above were only temporary. Please ignore them). 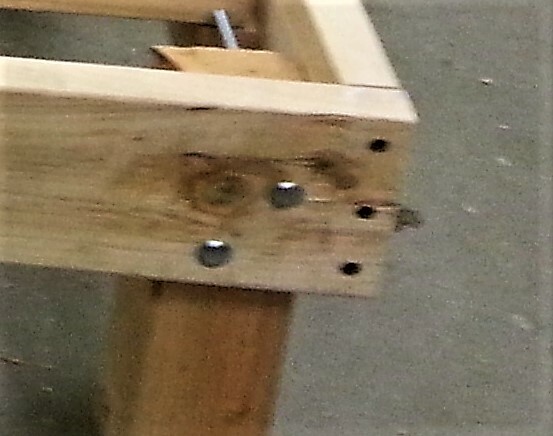 To attach the legs you will need to raise the frame first or work on it upside down using a piece of 2×4 to level the legs with the same level as the inside boards (the slats will rest on the legs too). I wanted the legs to be sturdy so I drilled two holes on an angle, straight through the post on each corner of the head and foot of the bed. See below (sorry, the image is not the best). Place bolts and nuts and tighten to make sure the frame is not wobbly. Then on the side of the bed, I drilled another hole for one bolt (making sure that I didn’t hit the same spot as the two bolts). I chose to make a simple headboard with one board only. I thought it had a nice Zen looking style with a clean line. Before attaching the headboard, lay the 2x6x76in onto the floor and select where you want the vertical support boards to go on the headboard frame. I chose to put each board in the center of each side of the middle frame. You can certainly move them closer to the edge or the middle but I thought this would make it more stable. When I took these pictures I haven’t started blogging about my projects so I know I’m missing a couple of step by step pics of the back of the frame and how I attached the side tables but it’s easy. Of course, no Zen retreat is complete without somewhere to put your tea on. Enter the “side tables“. They are basically shelves attached to the bed. But how cool is that? No need for extra furniture. It’s all in one piece. Before attaching the headboard you should install the “side tables” when you have the bed upside down (bottom up). That way you can simply lay the 2x6x17in board on the floor by the side of the bed and attach the “L” brackets without having to work “under” the bed. If you do this after the headboard is on then you can just raise the side of the bed you are working on with a bucket or something to have better access to install them. Notice I added casters to the legs? Well, I really didn’t have to do that since the daybed was going on grass. I figured it would be easier to drag it around if it had wheels but forgot that they would also sink on the grass. Sigh! At least you get an idea what it looks like with wheels in case you are doing this for a cement patio. Then you definitely want wheels. Installing them is easy. Simply flip the bed frame on its side and screw the metal brackets onto the bottom of the legs (they come with the wheels) and that’s it! I didn’t paint the slats because that would be a waste of good paint. They were going under the mattress anyway. Because I just can’t stop crafting, I decided that my zen daybed retreat was missing something. So I got some burlap and made these curtains to give it an extra zen look to my daybed (tutorial coming soon-psst, it’s no-sew!!). Notice the paint color for the stencil was similar to the bed cover? Isn’t this the best place to read or what?! Before I go, you must be wondering what happens to the mattress when it rains. I bought a sturdy plastic sheet and wrapped the mattress on it really well before putting the new cover on. There is some waterproof mattress covers out there too. But I just thought a sturdy plastic would do. I made this bed at least 2 years ago, and everything, including the mattress, looks good. Except for the terracotta cover: the sun really did a number on it. I will be replacing it soon. 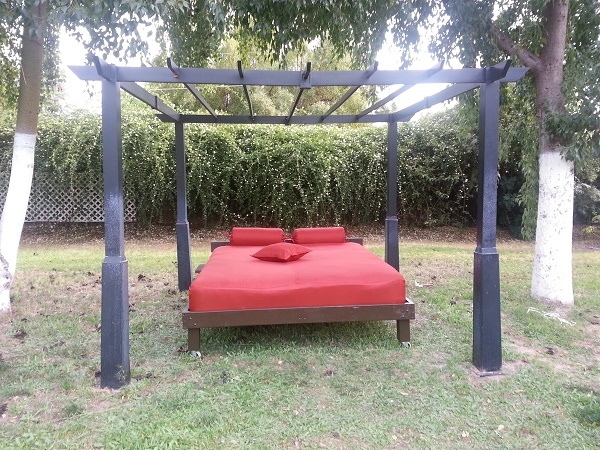 If you don’t think you have the skills, or time to make this daybed but you like the design, here are some fabulous outdoor daybeds that you can purchase. I hope you enjoyed this project. I so happy I was able to save a mattress from going to the landfill and got my Zen retreat in the process. Don’t forget to follow us on Facebook and Pinterest. Sign up for our email list below and receive updates and other news about upcoming projects and ideas. As a thank you for signing up, you will receive a nifty project budget checklist where you can make drawings, list your materials and even write down price comparison to make sure your project doesn’t get off track.